Updating Outlook profiles after completing the back end mailbox switch is required to connect the user to the target mailbox. Quest Migration Manager for Exchange ships with the CPUU (Client Profile Updating Utility), aka EMWProf, to streamline and automate this task. Although the configuration of a starter script is easy, we usually end up with an educated script that does a lot around the EMWProf procedure to avoid issues and to prepare for other services like Lync and Exchange UM. Based on the experience of several long time projects we recommend to have a look into the following aspects. Check if Outlook 2010 is configured with multiple accounts. Since there is a restriction with CPUU, users with multiple Exchange accounts in a single Outlook 2010 profile have to reconfigure Outlook or need to be supported after migration. Running EMWProf with administrative credentials can save a lot of access problems when switching profiles. Passwords are encrypted as a feature of the CPUU and this works fine. Running into the EMWProf script each time when a user logs on, creates too much impact. You can create a group, where membership is given after backend mailbox switch. You can create a check in the EMWProf script that checks whether EMWProf did run before on the client and prevents additional starting of the EMWProf procedure. Disable Windows Search. In many cases, Windows Search locked the ost file because of indexing and EMWProf could not rename it, what EMWProf caused to fail. You cannot stop the Windows Search service because it restarts by itself. Disable and enable afterwards. With Lync client installed and integrated with Exchange/Outlook, several Lync processes are active and block EMWProf from working properly. If the user has multiple profiles configured in Outlook 2010, EMWProf tries to process all of them and will create a return code that is not unique. You should first scan the registry for Outlook profiles in CPUU script and then run dedicated EMWProf for each profile, to get the return code. EMWProf will also send a message for each profile separately, which makes it easy to differ between good and bad, important and unimportant. Deployment of EMWProf via logon script is not enough in nowadays. Many laptops stay in Hibernate only and are unlocked w/o domain logon. As a fallback, a link in the Goodbye message should point to the EMWProf script and can be executed by the user. More advanced solutions distribute the EMWProf binaries via software distribution and the EMWProf script checks first, whether the binaries exist locally and if not, it pulls them from a remote share before executing. This helps a lot in small bandwidth scenarios. Even more educated solutions use a migration database where the EMWProf script can upload the results of the client side part of the mailbox migration. For terminal server use you should configure a specific EMWProf script. Processing of offline profiles is not necessary there as an example. Make the script as slim as possible and it will work fast and with less issues. Sometimes localized Goodbye/Welcome messages sent by QMM switch procedure are important. You can change the message text per Mail Source Agent. If you have regional based setup, you can send localized language mails easily by feeding the MSAs with a specific message text. Do you need a Welcome message sent by QMM? It has advantages and disadvantages. If mailbox switch and Outlook switch was successful, why confusing the user with more technical explanations and notifications. Heaven and hell of transferring read/unread status of items. QMM mail agents sync read/unread status and CPUU does as well to fill the last gap. This is very helpful to make the target mailbox experience for the user close to the “zero impact” (Quest language!) idea. However, this feature can turn into black, when the user starts to work for weeks with his Laptop and his new mailbox, then goes back to his Desktop Computer, is still connected to his old mailbox and executes EMWProf again. It does what it should and will make the items in target look like in the source mailbox. Be careful, we have seen assistants being very set up when realizing that they have 120 unread messages in the inbox from past weeks [again]. For the very same reason we do not use the SwitchRESMBX utility in situations where people work with passive (not yet switched) mailboxes in target. 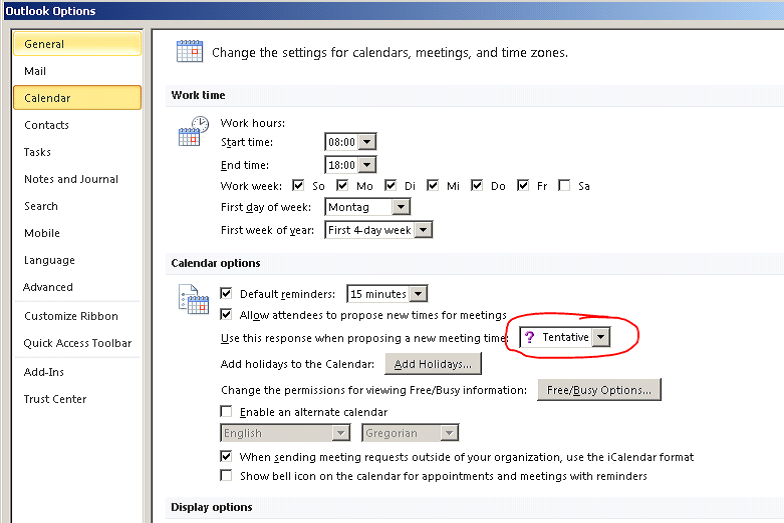 Note: When you choose “Decline and Propose New Time” Outlook will first decline the meeting request and then create a new one, which will be send back to the organizer. This is by design!